A question that is often asked is whether or not the Federal OSHA standards for portable fire extinguishers require employees to do “hands-on” training with extinguishers. And the answer is not as simple as “yes” or “no”; a better answer would be, “it depends”. So does “education” require hands-on training? If you refer to the definitions for Subpart L that appear in 1910.155, you will find that paragraph (c)(14) defines "Education" as “the process of imparting knowledge or skill through systematic instruction. It does not require formal classroom instruction.” In other words, at a minimum, you must provide those workers with instructions on the general principles of fire extinguisher use and the hazards of incipient (early) stage fires, but no actual hands-on training is required by OSHA. I have seen many employers handle this educational requirement by utilizing toolbox talks, safety videos, online classes, and/or informational brochures on the required topics. You may find it helpful to refer to the following OSHA letter of interpretation (see here) for further clarification. On the other hand, there are many employers who do designate some (or all) employees to use portable fire extinguishers. In fact, some OSHA standards, such as 1910.252(a)(2)(iii)(B) in the section for welding, cutting, and brazing (Subpart Q) even mandate that a trained fire-watch be stationed nearby when hot work is being conducted. And that is where OSHA standard 1910.157(g)(2) for portable fire extinguishers comes into play. It states that “the employer shall provide employees who have been designated to use fire-fighting equipment as part of an emergency action plan with training in the use of the appropriate equipment.” And if we refer back to the OSHA definitions for Subpart F at 1910.155(c)(41), we see that in the context of this particular standard, "Training" means “the process of making proficient through instruction and hands-on practice in the operation of equipment, including respiratory protection equipment, that is expected to be used and in the performance of assigned duties.” Therefore, in addition to general instruction, hands-on practice IS required for all employees who have been designated (or assigned) to use portable fire extinguishers. There is an OSHA letter of interpretation (see here) which states “OSHA does not require that fires actually must be started and extinguished to simulate emergency fire conditions during employee training. Hands-on training does not necessarily mean live fire demonstration.” However, the letter goes on to explain that “as a minimum, hands-on training should include the actual discharging of fire extinguishers appropriate for the type of fires expected . . .” So at a minimum, trainees should get the opportunity to discharge the type(s) of portable extinguisher(s) they are designated to use as part of their training, but a live-fire does not have to be part of the practice scenarios. Also, this is a good time to remind you that starting live fires under controlled conditions for practice can be very dangerous (and maybe even illegal in your area), so utilize trained professionals to conduct live-fire drills after seeking and gaining approval from local authorities. I have seen many instances where local fire departments and portable fire extinguisher vendors provided this training to employees for free! Employers also have one more option when it comes to portable fire extinguishers: If they write into their emergency action plan and fire prevention plan (covered in 1910.38 and 1910.39, respectively) that all (or certain) employees will immediately evacuate the building in case of a fire and that no one is to use an extinguisher (and train those employees about the plans), then neither education or training is required in portable fire extinguisher use for those employees. This assumes, of course, that there is no situation existing that specifically mandates someone trained in portable fire extinguisher use be available, such as in the welding standard previously mentioned. 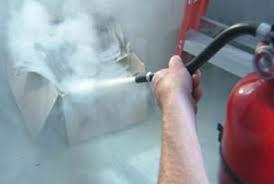 By the way, we offer a free online training tutorial on the use of portable fire extinguishers here. So to recap; employers who have portable fire extinguishers in the workplace must provide education on fire extinguishers for all workers, training for all designated workers, and nothing for any/all employees who have been specifically excluded in their emergency action plan from using fire extinguishers. And if you need one more thing to get your head spinning, just remember that the same requirements for hands-on training also apply to all employees who have been designated to use other fire-fighting equipment such as small fire hoses. ← Ticks are Back in Full Force!